Today's trillium I found on the road cut of the upper Tallulah River in the Chattahoochee National Forest, Rabun County, Georgia, USA. I believe it to be a Bent Trillium (Trillium Flexipes) because of the shape the braces. The flower itself nods below the whorl of leaves. Here I propped it up to show the flower better. Notice the smooth, oval-shaped edge of the pedal. The Catesby's Trillium I posted yesterday is similar except that the petals are wavy and recurved back. Also known as Nodding Trillium, the Bent Trillium antlers are supposed to be creamy white. 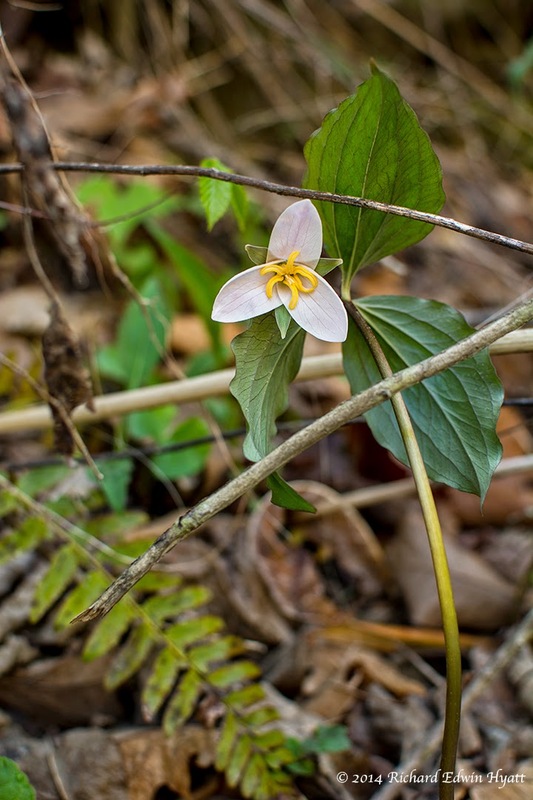 These, however, are showing yellow in my photo which means I may need to do more research to make sure it is a Bent Trillium.— at Chattahoochee National Forest, Rabun County, Georgia.